Airbus Helicopters was selected by the UK MoD to deliver 29 H135s under the UK Military Flying Training System (MFTS) programme. Image courtesy of Airbus Helicopters. The first H135 UKMFTS helicopter made its first flight in June 2016. Image courtesy of Airbus Helicopters. The H135 military training helicopter integrates new Helionix cockpit. Image courtesy of Airbus Helicopters. The H135 military training helicopter can fly at a maximum speed of 278km/h. Image courtesy of Airbus Helicopters. The H135 military training helicopter is manufactured by Airbus Helicopters to meet the flight training needs of armed forces across the world. The highly versatile platform is suitable for basic, advanced and mission training. 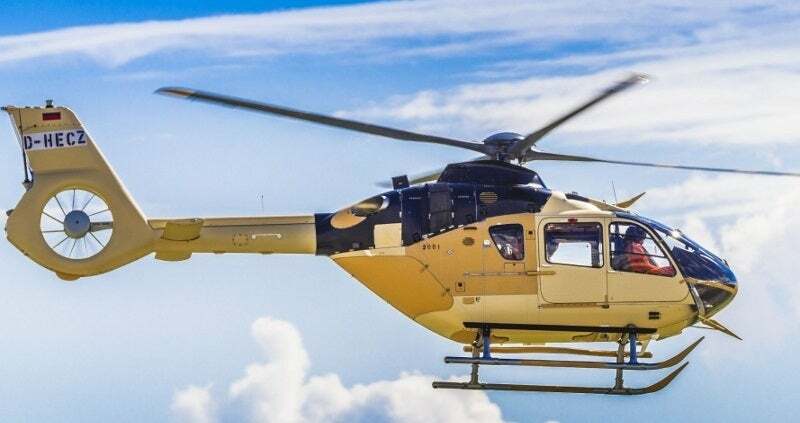 Airbus Helicopters received a 17-year contract worth £500m ($730m) from Ascent Flight Training in May 2016 to deliver 29 H135s and three hoist-equipped H145s to the UK Ministry of Defence (MoD), under the UK Military Flying Training System (UKMFTS) programme. Ascent is the UK MoD’s training service partner for the UKMFTS. The production ramp up and the maiden flight of the first H135 for UKMFTS were concluded in June 2016. Deliveries are scheduled to start in 2017 and will be completed in early-2018. The H135 military training helicopter is also in service with a large number of military operators worldwide, including the Australian Defence Force, Brazilian Air Force, Switzerland Air Force, German Army, Japanese Maritime Self-Defence Force, Jordanian Armed Forces and Spanish Army. The H135 training helicopter features an energy-absorbing fuselage and bearing-less main rotor system. The tail boom integrates a fixed horizontal stabiliser and Fenestron® anti-torque device. The new rotor blades and lateral air intakes provide higher lift for the helicopter. The helicopter also integrates energy-absorbing seats and crash-resistant fuel cells. The under-fuselage is fitted with skid-type landing gear with skid protectors. The unobstructed cabin and cargo compartments offer a storage volume of 5.9m³. The H135 measures 12.26m-long, 3.16m-wide (without blades) and 3.51m-high. The main rotor diameter of the helicopter is 10.40m and the maximum take-off weight is 2,980kg. The state-of-the-art technology aboard the helicopter enables the instructor to conduct training missions in optimal safety conditions. The high fuel economy of the rotorcraft further ensures low operating and training costs. The advanced glass cockpit of the H135 features three large electronic displays. It accommodates two crew members in side by side layout. The night-vision goggle (NVG) compatible cockpit also incorporates a first limit indicator, which displays engines’ operational data based on the phase of flight for the pilot in one indicator. The Helionix suite also integrates Garmin GTN-750 GPS, navigation and communication system, a TAS620A traffic advisory system, a helicopter terrain awareness and warning system (HTAWS), cockpit control panel (CCP) and a data transfer device (DTD). The TAS system enables pilots to detect and avoid aircraft approaching the flight path of the helicopter, while the HTAWS warns the pilots about hazardous terrain and obstacles on the flight path to avoid the risk of collision. The innovative cockpit layout offers increased situational awareness, mission flexibility and safety. The H135 helicopter integrated with new Helionix cockpit received the European Aviation Safety Agency (EASA) type certificate in November 2016. The Helionix avionics system in combination with four-axis automatic flight control system (AFCS) minimises the workload of pilots. The highly redundant system has the capability to automatically reconfigure and restore functions in the event of subsystems failure, without the need for pilot intervention. The helicopter is powered by either two Pratt & Whitney Canada PW206B3 or two Turbomeca Arrius 2B2 plus turbo-shaft engines. Each engine model features a full authority digital engine control (FADEC) system and over-speed protection system. Fuel is supplied from a bladder-type main fuel tank and a supply tank. The H135 has a maximum speed of 278km/h and can attain a maximum range of 609km. The maximum operating altitude of the helicopter is 20,000ft. The helicopter delivers superior one-engine inoperative (OEI) performance, even in hot and high conditions.